Fox NewsSean Hannity, left, interviews former President George W. Bush. Former President George W. Bush is already predicting the outcome of his brother’s potential presidential campaign: a victory for former Florida Gov. Jeb Bush (R) over Democratic front-runner Hillary Clinton. Jeb Bush has insisted he has yet to make a decision whether or not to run. But his family members have been more than willing to publicly encourage him. In an interview on Fox News’ “Hannity” set to air Thursday evening, George W. Bush declared he’ll still be friends with Clinton’s husband, former President Bill Clinton, after Jeb Bush wins in 2016. “Bill and I are going to have to have some interesting things to talk about. Look, I’ll still like him when Jeb beats Hillary,” Bush quipped about the potential showdown. After host Sean Hannity asked Bush if he was issuing a formal prediction on the outcome of the next presidential contest, he reaffirmed, “If Jeb runs” he’ll win. However, Bush said he didn’t have any inside knowledge as to whether or not his brother will ultimately launch a campaign. In at least one other recent interview, Bush, who is promoting his new book, “41: A Portrait of My Father,” also discussed a potential Bush vs. Clinton matchup and whether the electorate would be willing to back a third Bush’s presidential campaign. Bush’s father, former President George H.W. Bush, held the office before Bill Clinton. 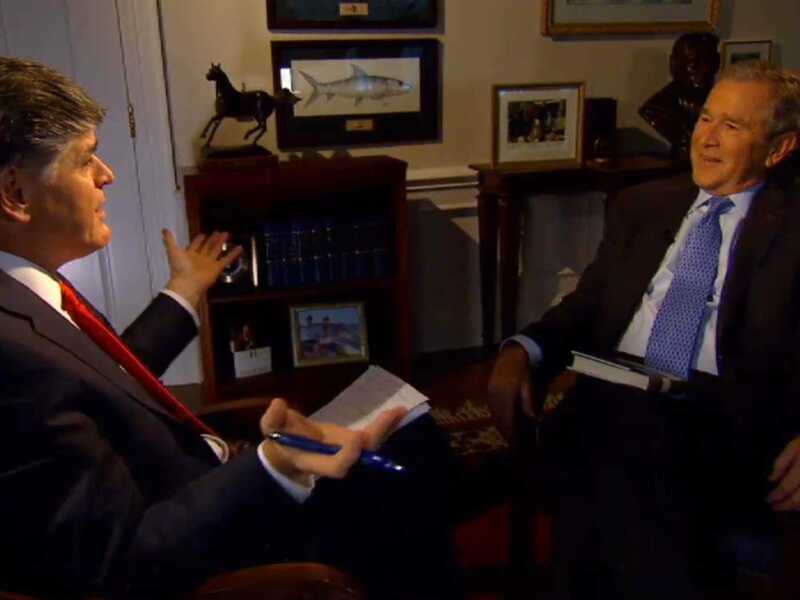 View a preview of Bush’s Thursday interview on “Hannity” below.